Spies, Traitors, Saboteurs: Fear And Freedom In America reveals nine major events and periods in U.S. history when Americans were threatened by enemies within its borders. It depicts how the government and public responded, illustrates the corresponding evolution of U.S. counterintelligence and homeland security efforts, and examines the challenge of securing the nation without compromising the civil liberties upon which it was founded. This exhibition covers nine acts of terror beginning with the burning of the White House in the War of 1812 and ending with the events of September 11, 2001. We advise visitor discretion (and children being 12+) due to the graphic nature of some of the film footage. 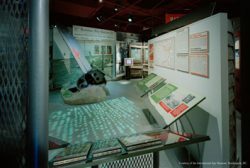 Spies, Traitors, Saboteurs: Fear and Freedom in America is a creation of the International Spy Museum. Local support provided by HMW Entertainment.